Cambridge, MA. Saturday, 6:10 PM. It’s been a few weeks since I’ve blogged — the combination of the hectic (beginning of semester), the exhausted (my three blogs on Dominus Iesus) and the happy (ceding this space for two unique and interesting entries by Deacon Mike Iwanowicz — be sure to check them out if you haven’t), but yesterday, when I decided it was time again to wield my might blogging pen, I was somewhat boggled by three possibilities, all of which are too much for a blog and, I fear, too little on their own. First, there is the Pope’s visit to Great Britain, on which many others, including Austen Ivereigh in this space, comment excellently; I thought of taking up his remarks at his meeting with religious leaders yesterday at St Mary’s University College, Twickenham, but while they are entirely appropriate, warm, and substantial to the extent that such things can be, the Pope says nothing that many another couldn’t have said. He too leaves unmentioned Dominus Iesus and its “robust” views of the uniqueness of Christ, universal evangelization, etc., and simply welcomes his sisters and brothers as equals. Wonderful, but nothing special. Second, there is Harvard. Whatever else one might say about the university and its Divinity School, they are certainly energetic and interesting places. As you may know, I am now Director of the Center for the Study of World Religions, so I am teaching just one course this semester — “Theology in an Interreligious Perspective” — with a very fine group of about 30 students. We are beginning to weave our way back and forth between thinking about religions and learning from them, between historical encounters, influential theologians and new voices in theology, and the Hindu and the Christian. My best problem at the moment is that our discussions are so very interesting that I wish we had longer and not shorter classes. I had the honor the other evening of introducing a distinguished swami visiting campus, Paramahansa Prajnanananda of the Kriya Yoga tradition made famous by his illustrious predecessor, Paramahamsa Yogananda (author of Autobiography of a Yogi, and of the Gospel commentaries I’ve mentioned here in the past); the event was somewhere between a religious event, sacred encounter, and teaching, and while I left early for other things, I am glad to have had the opportunity to welcome him to campus and experience the phenomenon. Yesterday I presided over a lunchtime discussion with students yesterday, a follow-up to a panel we hosted earlier in the month on “God and the Study of Religions.” It turns out there is a lot to say about God — God, god, gods, goddesses, divinity, meaning — but great difficulty in figuring out what wetogether can say on the topic. And we are also gearing up for the dedication of our simple Meditation Room at the Center on October 4, a lovely but mostly empty space meant to be an oasis of quiet and spiritual rest for faculty, staff, and students whenever they wish to drop by. Thus far the dedication seems likely to include Hindu, Buddhist, and Christian elements, and nicely falls on the feast of St. Francis of Assisi (and two days after Mahatma Gandhi's birthday). So I could say a lot about Harvard — but really, much of it comes down to, “you’d have to be here; come to visit,” and so I will stop. So you can see my dilemma, which I suspect I share with you: pondering how our Church and its Pope makes its way in a world of many religions, while I teach in a very very interreligious (even if secular) space, and then (like many of you) show up in church on Sunday. 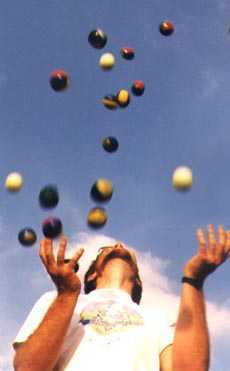 We are all jugglers, in and of faith. This could be simply confusing — go ahead, make it worse by adding your own examples — but I think it is also the right place to be: we do belong to a Church that is neither a product of our desires, nor able to make the world entirely Catholic; we do live complex religious lives that are becoming more and not less interreligious; and when we hear the Word of God, we are rightly confronted with the mystery of Jesus, but also with the “cultural baggage” of the church of I Timothy, views of human beings and society we ought not accept today. So we end up being the key to all this — responsible persons who, if we listen in all three directions (and more), can justly hope that we will find a way, in our world and Church but walking with our non-imperial Jesus, to make sense of the complexities God chooses to give us in 2010. Wow, you really have a challenge - to figure out how Timothy I is just not, "...baggage of the Church", but the word of God; not just, "a view of human beings and society to reject", but a truth revealed. I'll help you. For starters, Lady Gaga has something to say - and is something to look at; now, compare her to your mom. Or, your mom figure. Get it? Then there is the empty meditation room. What else can it be at Harvard except empty? Anything positive is deemed, well, 'pushy'. Or, so I imagine. I suspect this feeling would include any words of the Pope that anyone else could say. Does this stop G_d? No. Still, in an interesting class with 30 students surely something must be said; having the right touch and tone no doubt trumps having the right dogma. Unless, like St. Paul, you don't mind risking being beat up, let out a window in a basket, stuck in a prison, or hung on a cross in Rome. Isn't the message of Jesus suppose to be, "Good News"? Wouldn't that mainly include what would be seen as, "Good News"? Like that there is forgiveness, salvation, and eternal life in Bliss? And, Mercy besides Justice. To say nothing about justice here and now which some experience and many more do not. So, Hope. A day of repentance and fasting for Jews; a day of confronting the Word of God for others. So, how was the sermon received? I suppose if one doesn't challenge the baggage of the present culture too much they won't challenge you. "It turns out there is a lot to say about God — God, god, gods, goddesses, divinity, meaning — but great difficulty in figuring out what we together can say on the topic." In the good 'ol pre-interreligious dialogue days Fr. James Reichman, SJ at Seattle University offered a course on, "The Philosophy of God". There sure wasn't any lack of things to say together by taking that approach. Of course this was philosophy, not religion, not rituals, not practices, though these things bleed down from the basic rationality which concludes about God or makes derivatives from thence. Things like, "Is God One, and how is what is derived from God or part of God or what is is?